That is how you win a football game! The Notre Dame Fighting Irish defeated the Wake Forest Demon Deacons 56-27 on Saturday to improve to 4-0 on the season. This win was a breath of fresh air after a pair of lack luster performances. Notre Dame was dominant in every facet of the game in Winston-Salem and it was really fun to see this team show what it’s truly capable of. This was by far the best the Irish have looked since the first half against Michigan, so without any further ado, let’s break this one down. What Worked Well? Just About Everything. Notre Dame’s offense hit new heights with Ian Book under center, but more on him in a bit. Jafar Armstrong had a career-best day with 8 carries for 98 yards and 2 touchdowns. Chase Claypool, Chris Finke, and Alize Mack all had strong games catching the football. Even the offensive line saw improvement in this one after struggling early in the year. The defense continued to dominate as a unit with an all around performance similar to the one we saw against Michigan. They had 3 sacks and 10 tackles for a loss and forced 1 turnover on Troy Pride’s interception. Among the standouts were the usual suspects from past games: Alohi Gilman had 9 more tackles and Drue Tranquil was right there with him as he recorded 8 tackles and a sack. It seemed the entire team fed off the improved quarterback play. The run game was more wide open, giving it the chance to create more big plays. The defense could tee off and play aggressively, something it’s very well suited to do. It felt like the coaching staff wanted to come out and impose this team’s will on an opponent, rather than handling the game plan with kid gloves. With that in mind lets move on to who stood out. I could pick a lot of players to be recognized in this portion of the recap, but only one could truly claim the honor, and that one player is quarterback Ian Book. 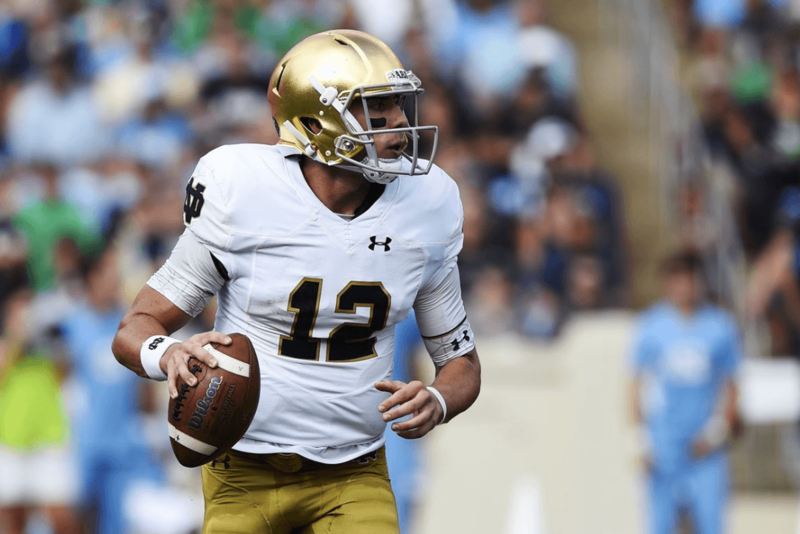 Earlier this week rumors swirled that Brian Kelly and the coaching staff would pull the trigger on a quarterback change. It wasn’t an easy decision for them as Brandon Wimbush is 12-3 as the starter in South Bend. But the offense had become stagnant and it clearly needed a different look under center. So Kelly turned to Book – the hero of last year’s bowl game win over LSU – to change things up and be more effective in the passing game. It’s an understatement to say that number 12 delivered for the Irish. Book went 25/34 for 325 yards and 5 total touchdowns (2 passing and 3 rushing). There was a clear difference in the ND passing attack with Book running the show instead of Wimbush. The ball came out on time and open receivers were hit in stride. Book spoke with ESPN’s Holly Rowe after the game, to discuss the win and his teammates helping him out. Book gave ND just what they needed and this is cause for a lot more positivity heading into next week’s matchup against Stanford. If he can keep this up the Irish will be very hard to beat for any team on the rest of their schedule. Now, normally I would include a “What Needs to Improve” section in this recap, but after a win like that there isn’t much that needs improvement. Outside of a few bad penalties, the Irish played an all-around fantastic game. They’ll need to carry that level of play over to next week against a Stanford team that pulled off an incredible comeback against Oregon on Saturday. The Irish will have to slow down Cardinal running back Bryce Love, who is coming off his best game of the young season against the Ducks. The Notre Dame secondary will also be tested as they have to cover Stanford Quarterback KJ Costello’s array of weapons. The Cardinal receivers play with size and physicality, particularly JJ Arcega-Whiteside, who is an absolute load in coverage. Regardless of the matchup the Fighting Irish should feel good after a dominant performance like Saturday’s, and with their home crowd behind them, the Irish have a great chance to win this rivalry matchup. As always, stay tuned for continuing Notre Dame coverage here on Slant Sports and you can follow me on twitter @PBPNick. Enjoy the win everyone and Go Irish, Beat Stanford!